which the symmetry breaking by interfaces induces strong Dzyaloshinskii-Moriya Interactions (DMI). 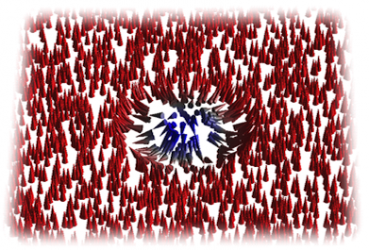 These findings open the road to room-temperature skyrmion spintronics. 2) Conversion between charge and spin currents by SOC : I will present a review of spin-orbit effects allowing the conversion of charge current into spin current (or vice-versa), by the Spin Hall Effect in bulk materials or by Rashba effects at interfaces. I will then briefly discuss the motion of magnetic domain walls and switching of nanomagnets by the resulting current-induced SOC torques. Dr. Vincent Cros was appointed in 1998 as CNRS researcher in the joint CNRS/Thales research lab (Palaiseau, France) that one of the pioneer groups in the field of spintronics. Since 2000, he is leading there the research activities on spin transfer effects and its related potential applications to radiofrequency spintronic devices. His current research interests include : spin transfer induced motion of single or coupled magnetic solitons, nonlinear phenomena such as parametric excitations or synchronization induced by spin torque, influence of spin-orbit torques on the magnetization dynamics and more recently the physics of magnetic skyrmions. In 2013, he received the Carnot prize from the French Academy of Sciences for his work in spintronics.